Today we give you blogger tutorial about how to change your mouse cursor in blogger blog to an animated cursors. We give you best way to add animated cursors in your blog to give good look when any one visit your blog and changing your mouse cursor to animated cursors. You can easily change your mouse cursor to animated cursors in blogger or BlogSpot blog. You can decorate your blogger blog to good look. We give you step by step tutorial to change mouse cursor to animated cursors. Log in into your blogger Account and go to blogger dashboard. First back up your template or you can also read How to backup blogger template to know more about backup template in blogger. 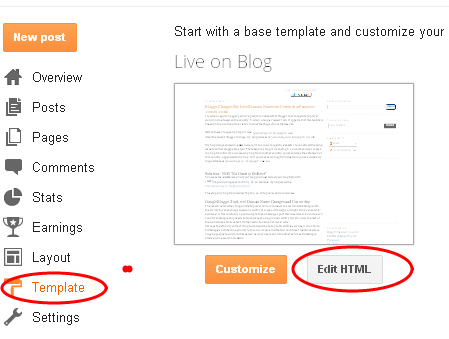 Go to Template and click on Edit HTML as shown in below picture. Please select your mouse style then Copy and Paste below code before it.